S I G N & D I G I T A L G R A P H I C S • June 2018 • 11 Avery Dennison Recognizes Suppliers at Awards Ceremony Pressure-sensitive films company Avery Dennison, which has its headquarters in Mentor, Ohio, and sells into a variety of industries around the globe, announces the results of its recent global awards ceremony where it recognized eight of its industry suppliers. The ceremony was held in Oegstgeest, Netherlands. The company says winners were selected based on their performance in areas such as sustainability, innovation, service and quality. Here a few of the awards given, and why Avery Dennison says each company won: • Supplier Distinction Award: This award was introduced to highlight a supplier that makes extraor- dinary contributions to Avery Dennison's success. Jerich International in Gleisdorf, Austria, is a global logistics provider, received the honor. • Best Supplier Sustainability: Eneco Wind of Belgium. This award goes to the supplier that demon- strated both leadership and action to align with Avery Dennison's sustainability policy to use responsibly sourced, verified materials. Eneco partnered with Avery Dennison to build and launch last fall a wind tur- bine at Avery Dennison's Turnhout, Belgium, plant. This turbine will supply about one-third of the plant's energy demand while also lowering the company's energy costs. • Best Supplier Service: Gantrade Corp. of Montvale, New Jersey. This award goes to the supplier who in 2017 constantly met Avery Dennison's availability targets and found ways to reduce overall supplier lead times. "Our suppliers play a key role in our mission to deliver value to our customers," says Roland Simon, global vice president of procurement and corporate sustainability for Avery Dennison's label and graphic materials division. "This ceremony serves as a platform to showcase our suppliers' innovations and out- standing support, and to thank them for their collaboration and consistent performance." Need nancing options? Whether you are buying or selling – we offer fast financing for a fast world. 877-786-5327 | print@directcapital.com directcapital.com/SDGmag Visit us in booth 316 at the NBM Cleveland show! 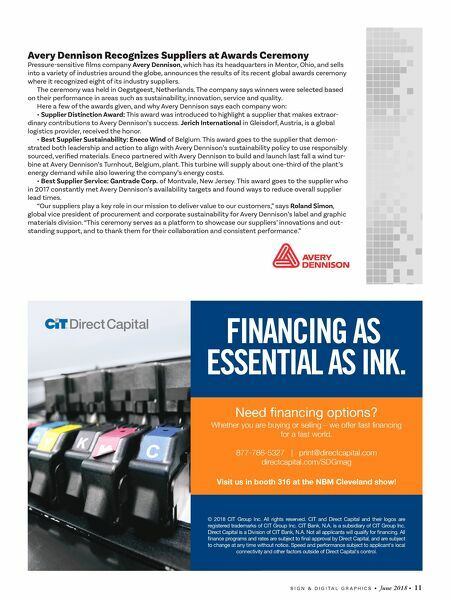 FINANCING AS ESSENTIAL AS INK. © 2018 CIT Group Inc. All rights reserved. CIT and Direct Capital and their logos are registered trademarks of CIT Group Inc. CIT Bank, N.A. is a subsidiary of CIT Group Inc. Direct Capital is a Division of CIT Bank, N.A. Not all applicants will qualify for nancing. All nance programs and rates are subject to nal approval by Direct Capital, and are subject to change at any time without notice. Speed and performance subject to applicant's local connectivity and other factors outside of Direct Capital's control.